Thanko, the innovative Japanese gadget inventor and online outlet has come up another product-solution to a problem you didn’t know you had. 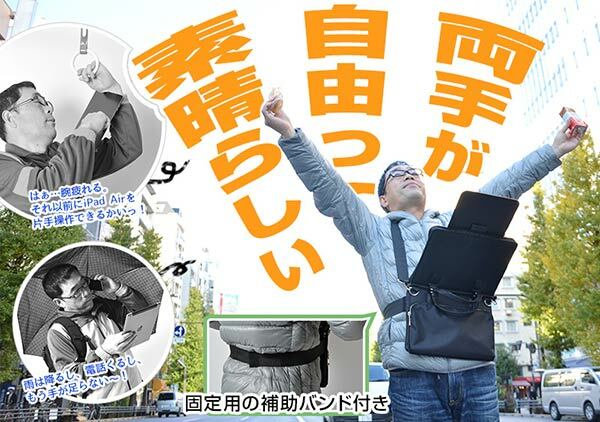 This time the firm has concocted a shoulder bag which incorporates a hands-free tablet stand. It is foreseen as being useful when commuting, standing up on the busy subway trains in Tokyo, for example. The shoulder bag tablet toting device allows you to carry your tablet in safety, thanks to a decent amount of padding. Then when you are standing around idle with nothing else to do you can unzip and unleash your tablet-orientated fun. As you can see from the video below the built-in tablet holder lets you extend the tablet’s distance from your body, angle the tablet and also even rotate it as you prefer. So a Thanko shoulder bag tablet stand owner can enjoy their digital content with both hands free. That’s a lot better to the alternative, as you can see from the firm’s subtle marketing photography above. The shoulder bag and stand is compatible with a wide range of tablets with dimensions between 140 and 170mm wide and 225 to 255mm long and as much as 10mm thick. Thus compatible tablet are, according to the firm, the iPad Air, iPad Air2,Google Nexus 9,Kindle Fire HDX 8.9 and others. It weighs just under a kilogram plus the weight of your tablet, of course. The shoulder strap equipped with the bag can be adjusted between 810 and 1,420mm. This accessory isn’t limited to people who hang around in subway trains the built-in stand can be separated from the bag to be used on the back of a car seat, on a wall or on a desk too. The bag, codenamed BAGTAB2K, is available for just under 5,000 Yen including tax which is equivalent to US$42 or GBP£27. Of course you’ll have to pay some kind of exorbitant shipping fee out of Japan.